Although not a required field, it is recommended to check the box for the day(s) the class meets. Note: Days the Class meets should be checked in order for Classes to display on Calendars and Schedules. You can add the Tuition Fee, Max Size, and Tuition Billing Method at this time or you can add them later. 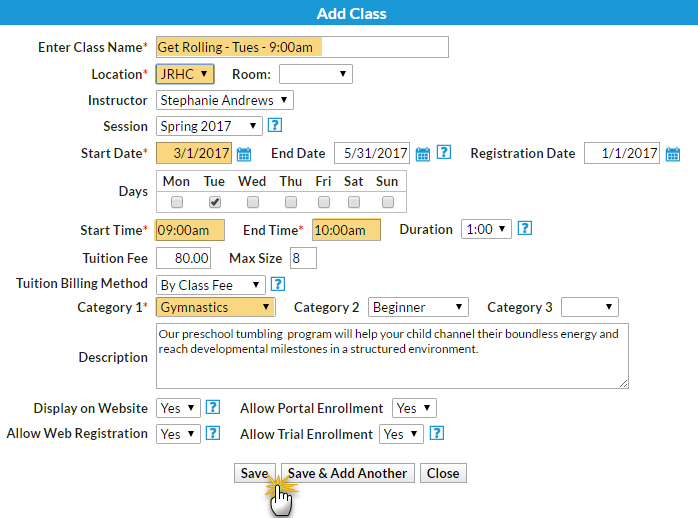 Set your preferences for Display on Website, Allow Web Registration, Allow Portal Enrollment, and Allow Trial Enrollment. See the Class Fields Explained section of this article for more information about these fields.